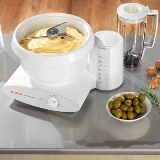 The BOSCH UNIVERSAL PLUS MIXER can multi-task for you with attachments for all types of food preparation. Jobs that once took hours to do can be done quickly with this powerful machine. The right tool can make all your food prep more efficient. The COOKIE PADDLES are one of our favourite tools. These sturdy beaters can be used for creaming light batters or mixing stiffer cookie dough. CAKE PADDLES are specially designed for smooth batters such as cakes, pancakes and puddings. The DOUGH HOOK EXTENDER is a recent and welcome addition. Place it under your dough hook and your mixer will effectively knead small batches of dough for specialty breads, sweet rolls, or pizza crust. The BOWL SCRAPER snaps on in seconds and cleans both the column and the side of the mixing bowl during the mixing process, eliminating the need to stop and scrape the bowl. The BOSCH BLENDER is the most efficient one we have used. 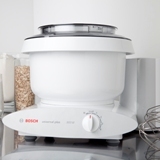 It can made bread crumbs in seconds. Make fruit and yogurt smoothies, your own V-8 juice or tomato soup, pumpkin pie filling, popovers and omelets, to name a few. For crushed ice, add a tray of ice cubes with enough water or juice to cover them and pulse until desired consistency is reached. The FOOD PROCESSOR runs off the high speed drive (side tower) with a blade for chopping nuts, making homemade salsa, baby food, and more. It also comes with discs for slicing, grating, and shredding. The BOSCH SLICER/SHREDDER or the LARGE SLICE & SHRED will make quick work of all your slicing, grating, and shredding jobs. Would you like to slice or grate fresh vegetables for summer salads in the blink of an eye? Love scalloped potatoes but hate trying to get even sized slices, to say nothing of cutting the onions and grating the cheese? Do all of these in less than a minute each. The BOSCH MEAT GRINDER plus SAUSAGE STUFFER lets you make homemade ground beef and sausage. Delicious homemade ice cream is just minutes away with the ICE CREAM MAKER attachment and the mixer does all the churning for you. The new PASTA ROLLER attachments uses the power of the Bosch Universal Plus to make oodles of homemade noodles, creating sheets of fresh pasta for ravioli and lasagna, thin spaghetti or hearty fettuccine. Fresh pasta is easy and economical to make.